We’re sorry, but we’ve run out of samples of Muse® MasterPieces®. How about a delicious deal instead? Finding your cat’s favorite Muse is easy! 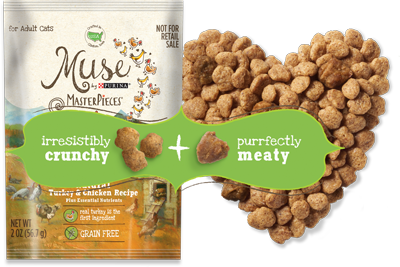 Muse wet and dry cat foods are available at pet specialty stores and online retailers. Offer valid thru 12/31/18 or while supplies last. Good only in the USA, APOs, FPOs. LIMIT ONE REQUEST PER INDIVIDUAL, HOUSEHOLD OR E-MAIL ADDRESS. P.O. Box address not accepted. Void where taxed, prohibited or otherwise restricted. Sale, purchase, assignment or other transfer prohibited. Group requests void. Please allow 6-8 weeks for shipment. Submissions that in Nestlé Purina PetCare Company's sole discretion do not comply with terms and conditions of offer, including fraudulent submissions, are invalid. Fraudulent submission could result in prosecution under Federal mail and/or computer fraud statutes. Offer may not be published elsewhere without written permission from Nestlé Purina PetCare Company, Checkerboard Square, St. Louis, MO 63164. See full terms at www.purina.com/terms-and-conditions.